Stu­dents who have enrol­led for a cour­se of stu­dies at a uni­ver­si­ty have alrea­dy deci­ded in which sec­tor they wish to work. Howe­ver, they may find it dif­fi­cult to choo­se a spe­ci­fic occupa­ti­on, as the requi­re­ments in the employ­ment mar­ket are con­stant­ly chan­ging. Care­er days are a good oppor­tu­ni­ty to learn about what is cur­r­ent­ly avail­ab­le on the job mar­ket. Klasmann-Deilmann deci­ded to take part in the Care­er Day held by Wagenin­gen Uni­ver­si­ty in the Nether­lands. What occupa­ti­on is the right one for me? What qua­li­fi­ca­ti­ons do I need? And which com­pa­ny can offer me the oppor­tu­nities I ima­gi­ne for me and my future? The­se are just some of the ques­ti­ons that young peop­le ask them­sel­ves when try­ing to deci­de on a care­er. Wagenin­gen University’s Care­er Day gave stu­dents the chan­ce to speak to many dif­fe­rent employ­ers and find out about the requi­re­ment pro­files for dif­fe­rent jobs. Klasmann-Deilmann appre­cia­tes the chan­ce to con­tact poten­ti­al juni­or employees at an ear­ly sta­ge. As a medi­um-sized enter­pri­se that wis­hes to help shape an inno­va­ti­ve future for the hor­ti­cul­tu­ral busi­ness, we are always loo­king for well-edu­ca­ted and high­ly qua­li­fied spe­cia­lists. We are always pre­pa­red to look bey­ond our own hori­zons and net­work with other coun­tries. This year, we took part in the Care­er Day at Wagenin­gen Uni­ver­si­ty in the Nether­lands for the first time and had the chan­ce to talk to under­gra­dua­tes and post-grad stu­dents in a casu­al atmo­s­phe­re on cam­pus at Wagenin­gen Uni­ver­si­ty & Rese­arch (WUR). Our stand was staf­fed by Ilka Kra­ne (Human Resour­ces) and Sjors Bei­jer, who stu­di­ed at Wagenin­gen him­s­elf and assists our sales team in the Nether­lands and our inter­na­tio­nal pro­duct inno­va­ti­on team. 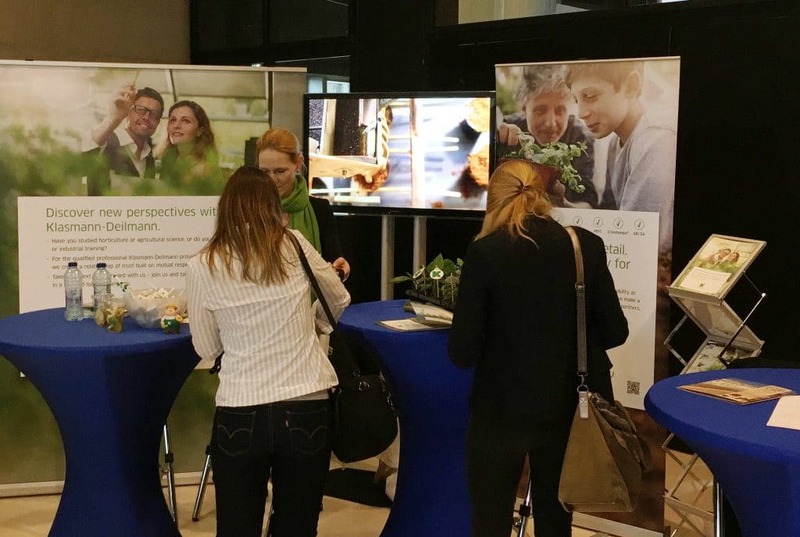 Our team at the event infor­med stu­dents about what Klasmann-Deilmann had to offer as an employ­er and exp­lai­ned various care­er opti­ons at our inter­na­tio­nal group of com­pa­nies. We are tho­rough­ly satis­fied with the respon­se and are alrea­dy loo­king for­ward to taking part again in next year’s Care­er Day.